There are 367 days in a year. Originally the calendar was based off of the dwarven calendar. This consisted of 24 Eval, or “walks,” of 15 days each. The 15 days signified the amount of time it took to walk by foot from the gates of Gorthurag to Gods Forge at the top of Mount Austerien. This journey was a holy journey for dwarves and called the Forahnock. The dwarves set aside 7 days at the end of each year as a time of rest; this was called the Rik. During the Winter Dark the calendar was changed to reflect a more orderly world. The cycles were set to reflect the cycle of the moon and the seasons. The dwarven Eval were converted into 12 months, however, the measurements were never perfect, reflecting Ea-Raena’s constant rebellion against Unklar and the number of days in a month were adjusted, some possessing more days than others. 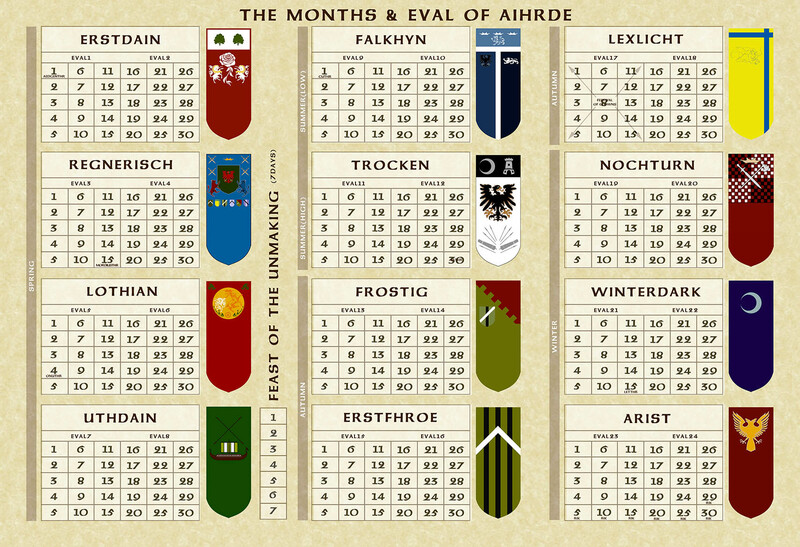 After the collapse of Aufstrag, both calendars were combined by the Council of Light. The year now is divided into 13 months. Twelve of the months each have thirty days, but the thirteenth month is a celebratory month, the Feast of the Unmaking, and is only 7 days long. Though there are many local and religious holidays, the Feast of the Unmaking is celebrated throughout many of the Young Kingdoms as a time of thanksgiving for the destruction of Unklar. Time is generally tracked by the day of the month that it is, not the eval or rik/week. So one would say it is the 14th of Trocken.